The Sterling Highway begins 90 miles south of Anchorage at its junction with the Seward Highway at Tern Lake, travels west to Soldotna, then south to Homer. The Sterling Highway passes through Chugach National Forest and Kenai National Wildlife Refuge lands. 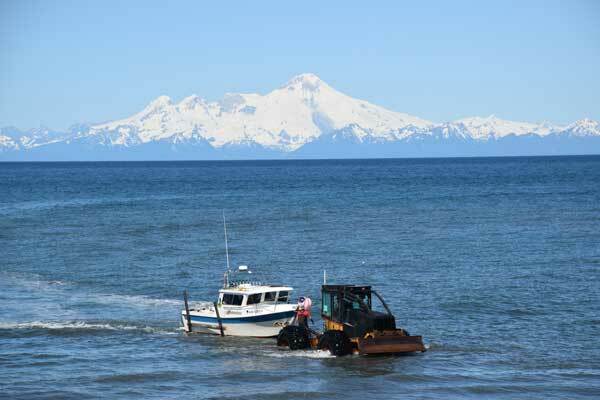 For sportfishermen, the Sterling accesses Kenai Peninsula lakes, rivers and streams, and the waters of Cook Inlet. Most of the Sterling Highway is 2 lanes, with some passing lanes, and a few short sections of 4-lane highway. The Sterling Highway opened in the fall of 1950, and was named in honor of Hawley Sterling, an engineer of the Alaska Road Commission. Mileposts reflect distance from Seward (S), followed by distance from Anchorage (A) and Homer (H). S 37 A 90 H 142.1 Junction of the Sterling Highway with the Seward Highway at Tern Lake. S 44.9 A 97.9 H 134.2 Junction with Quartz Creek Road to day-use areas and USFS campground on Kenai Lake and Crescent Creek USFS campground. Sunrise Inn; gas, cafe, bar, motel. S 47.7 A 100.7 H 131.4 Turnoff for Kenai Princess Wilderness Lodge and RV Park. Outdoor dining with view of Kenai River. S 48 A 101 H 131.1 Cooper Landing State Recreation Site; boat launch (pictured at right), day-use area. S 48.3 A 101.3 H 130.8 Drifter’s Lodge; cabins, Kenai River rafting and fishing trips. S 48.4 A 101.4 H 130.7 COOPER LANDING (pop. 250); food, gas, lodging, camping. Cooper Landing Museum has a fully articulated brown bear skeleton. S 48.5 A 101.5 H 130.6 The Hutch B&B, lodging. S 49.7 A 102.7 H 129.4 Kenai Riverside Campground, RV Park and B&B. S 50.1 A 103.1 H129 Kenai River Trips with Alaska Wildland Adventures. S 50.5 A 103.5 H 128.6 Bridge over Cooper Creek. Turnoff for Cooper Creek USFS Campground (South). S 50.6 A 103.6 H 128.5 Turnoff for Cooper Creek USFS Campground (North). S 52 A 105 H 127.1 Gwin’s; long-time local landmark; food and lodging. S 52.6 A 105.6 H 126.5 Russian River USFS Campground to south. K’Beq Heritage Site to north. S 54.9 A 107.9 H 124.2 Kenai Russian River Access/Sportsman’s Access Site/Kenai-Russian River Ferry entrance. S 58 A 111 H 121.1 Junction with Skilak Lake Road which loops southwest to recreation sites in Kenai National Wildlife Refuge. S 60 A 113 H 119.1 Jean Lake Campground. S 68.8 A 121.8 H 110.3 Petersen Lake and Kelly Lake Kenai National Wildlife campgrounds. S 71.3 A 124.3 H 107.8 Watson Lake Kenai National Wildlife campground. S 76.1 A 129.1 H 103 PW Knives knife shop. S 80.3 A 133.3 H 98.8 Access to Bing’s Landing State Recreation Site; camping. S 81 A 134 H 98.1 STERLING (pop. 6,011); food, gas, diesel, lodging, camping. S 81.2 A 134.2 H 97.9 Moose River RV & Auto Parts; phone 907-262-5333. S 81.5 A 134.5 H 97.6 Gas/diesel/propane with ATM and convenience store and sani-dump. S 81.7 A 134.7 H97.4 Izaak Walton State Recreation Site; camping, boat launch. S 83.4 A 136.4 H 95.7 Junction with Swanson River Road to canoe trails; The Wash Out Laundromat, phone 907-262-7666, 0.1 mile north. S 84 A 137 H 95.1 Lodging, camping and canoe rentals. 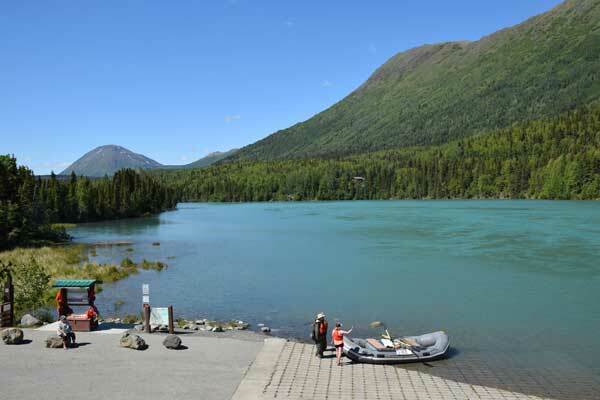 S 84.9 A 137.9 H 94.2 Turnoff to south for Scout Lake Loop Road for Scout Lake State Recreation Site (0.1 mile) and Morgan’s Landing State Recreation Site (2.4 mile); camping, Kenai River bank fishing access. S 88.3 A 141.3 H 90.8 Alaska Horn & Antler Carvings and Rock Shop; phone 907-262-9759. S 91.3 A 144.3 H 87.8 Gas, diesel, grocery, liquor. S 93.8 A 146.8 H 85.3 Brewery/restaurant to south. S 93.9 A 146.9 H 85.2 Fred Meyer’s (store, gas, fast-food) to south. S 94 A 147 H 85.1 Traffic light at Devin Drive. Turnoff to Fred Meyer’s, gas/diesel, fast-food. Overnight parking permitted for self-contained RVs (signed area in Fred Meyer’s parking lot). S 94.1 A 147.1 H 85 East Redoubt Avenue to south leads to Swiftwater Park Soldotna city campground. S 94.2 A 147.2 H 84.9 Junction with Kenai Spur Highway at Soldotna Y. Westbound traffic takes right fork north for Soldotna businesses then continues 11 miles north for city of KENAI (pop. 7,098); all services. Kenai Spur ends at Discovery Campground in Captain Cook State Recreation Area (39 miles from junction). For more Soldotna businesses and visitor information, and for Homer, westbound traffic continues on Sterling Highway. S 94.4 A 147.4 H 84.7 Entrance to Soldotna Creek Park; day-use area, access to fish walk. Weekly concerts, vendor markets and special events take place at this park. Special event overflow parking behind gas station at Birch Street traffic light. S 95.1 A 148.1 H 84 Traffic light at Binkley Street; Peninsula Center Mall. S 95.2 A 148.2 H 83.9 SOLDOTNA (pop. 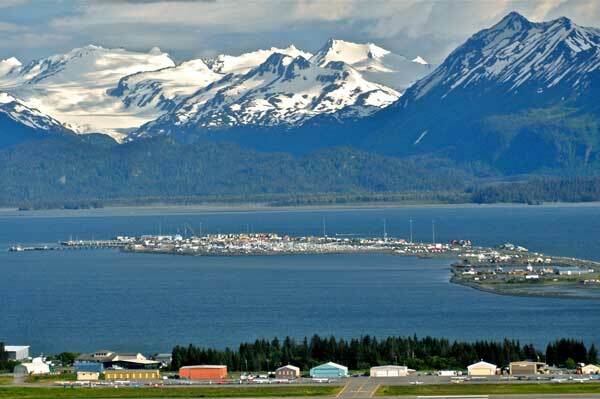 4,376) is a retail, governmental and medical hub for the Kenai Peninsula; all services are available. S 95.6 A 148.6 H 83.5 Kenai River (David Douthit-Veterans Memorial) Bridge. S 95.9 A 148.9 H 83.2 Soldotna Visitor Information Center to west at south end of Kenai River bridge. 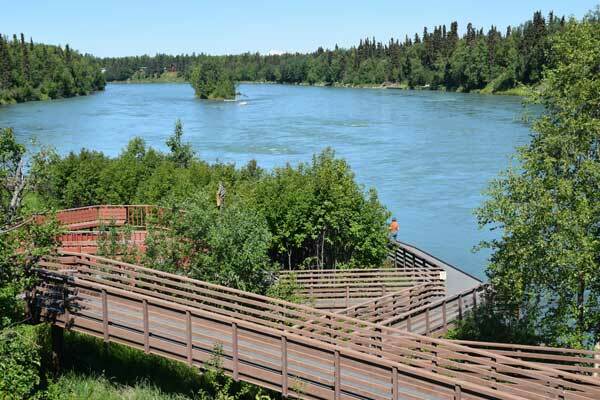 Short walking path to fishwalk on Kenai River (pictured below). S 96 A 149 H 83.1 Junction with north end of Kalifornsky Beach (K-Beach) Road; access west 0.1 mile then turn north for Centennial Park Campground, and Homestead Museum. Continue 5.5 miles west on K-Beach Road for Diamond M Ranch Resort. Turnoff to east for Funny River Road and access to Edgewater Lodge & RV Park and Klondike RV Park & Cottages. 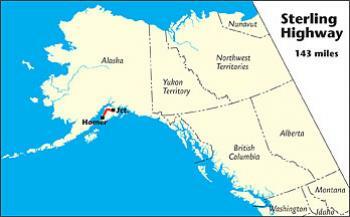 Soldotna Municipal Airport 1.8 miles east; Natron Air offers fly-out fishing and Cook Inlet bear viewing trips. Funny River State Recreation Site is a Mile 11.2 Funny River Road. S 98 A 151 H 81.1 Turn off on Ski Hill Road to east for Kenai National Wildlife Refuge Visitor Center. S 102 A 155 H 77.1 Gas, diesel, convenience store. S 108.6 A 161.6 H 70.5 Junction with south end of Kalifornsky (K-Beach) Beach Road. S 109 A 162 H 70.5 KASILOF (pop. 532); general store. S 109.2 A 162.2 H 70.3 Kasilof Riverview Tesoro; groceries, gas, diesel, propane; espresso; liquor store; tackle; ATM; phone 907-262-1573. S 109.5 A 162.5 H 69.6 Turnoff for Kasilof River State Recreation Site (boat launch, fishing, picnicking). S 110.1 A 163.1 H 69 Central Emergency Services/Kasilof Station on west side of highway. S 111 A 164 H 68.1 Junction with Cohoe Loop Road; access to Crooked Creek State Recreation Site (1.5 miles, turn right on Rilinda Road then keep to left 0.4 miles). S 117.4 A 170.4 H 61.7 Clam Gulch State Recreation Area; camping, access to beach. The clam fishery is closed; see current regulations and restrictions. S 118.2 A 171.1 H 61 CLAM GULCH (pop. 167); post office. S 134.5 A 187.5 H 44.6 Ninilchik River State Recreation Site Campground. S 134.6 A 187.6 H 44.5 Turnoff to west on Orthodox Avenue for Holy Transfiguration of Our Lord Russian Orthodox Church (pictured at left). S 134.9 A 187.8 H 44.2 Ninilchik River Scenic Overlook and Campground. S 135.1 A 188.1 H 44 Turnoff to west on Mission Avenue for NINILCHIK VILLAGE; also access to boat harbor and eagle-watching in summer via frontage road. S 135.4 A 188.4 H 43.7 Turnoff for Kingsley Road access to Alaskan Angler RV Resort, Cabins and Afishunt Charters. S 135.5 A 188.5 H 43.6 Ninilchik View State Campground. S 135.8 A 188.8 H 43.7 Ninilchik General Store (groceries, bait, licenses, supplies) and Afishunt Charters. S 135.9 A 188.9 H 44.2 Junction with Oilwell Road; gas station. NINILCHIK (pop. 860) has fishing charter services, campgrounds, a general store, pizza/burgert place. All Seasons Campground 3 miles off highway on Oilwell Road, phone 907-567-3396 or (email). S 136.2 A 189.2 H 42.9 Deep Creek View Campground and J & J Smart Charters. S 136.7 A 189.7 H 42.4 Deep Creek North (camping) and Deep Creek South (day-use area). S 137.3 A 190.3 H 41.8 Turnoff to west downhill for Deep Creek State Recreation Area. S 151.9 A 204.9 H 27.2 Stariski State Recreation Site campground. S 156.3 A 209.3 H 22.8 Grocery, 24-hour gas station. S 156.6 A 209.6 H 22.5 ANCHOR POINT (pop. 2,043) post office. 24-hour gas/diesel convenience store at Thurmond’s Far West Auto; phone (907) 235-5601. S 156.7 A 209.7 H 22.4 Junction. Access east on North Fork Road for Sleepy Bear Cabins (0.1 mile). S 157.1 A 210.1 H 22 Junction with Anchor River (Beach) Road; food and lodging. Access to Kyllonen’s RV Park at Mile 1.3, campgrounds and fishing in Anchor River State Recreation Area. Anchor River (Beach) Road dead ends at Cook Inlet at the most westerly point in North America accessible by continuous road system. Watch tractor-trailers launch and retrieve boats from Cook Inlet (pictured at right). S 161 A 214 H 18.1 Black Water Bend Espresso, phone 907-235-6884, and order your coffee ahead of time or by email. Take Norman Lowell Road, south and to the east from here to the Norman Lowell gallery. S 164.8 A 217.8 H 14.3 Junction with Old Sterling Highway. S 169 A 222 H 10.1 Gas, groceries and snacks, and full-service RV sites at Bay Crest RV Park. 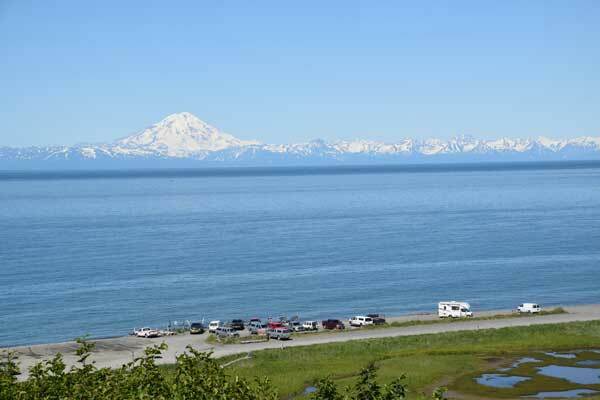 S 169.6 A 222.6 H 9.5 Popular viewpoint/rest area for photos of Homer Spit and Kachemak Bay. S 172.5 A 225.5 H 6.6 Best Western Bidarka Inn, Fireside Lounge and Otter Room Grill. S 172.8 A 225.8 H 6.3 Junction with Pioneer Avenue and access to Pratt Museum and downtown HOMER (pop. 5,252); all services. S 173 A 226 H 6.1 Homer Chamber of Commerce Visitor Center. S 173.1 A 226.1 H 6 Junction with Main Street; turn west for Driftwood Inn & RV Park and Bishop’s Beach. 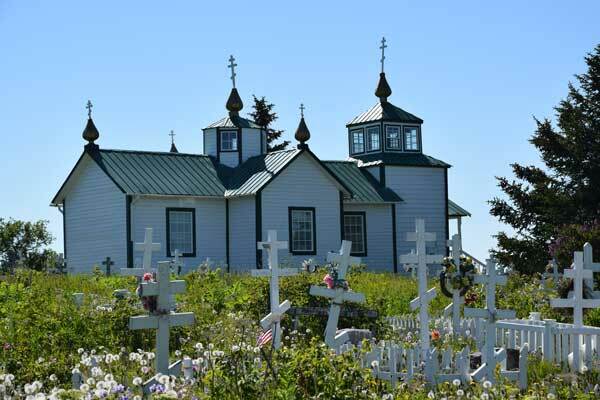 S 173.2 A 226.2 H 5.9 Alaska Islands & Ocean Visitor Center. S 174.1 A 227.1 H 5 Beluga Lake Lodge. S 174.2 A 227.2 H 4.9 Farmer’s Market in summer, Wednesday afternoons and Saturdays. S 177.7 A 230.7 H 1.4 Heritage RV Park. S 178.1 A 231.1 H 1 Freight Dock Road; access to public boat ramp, boat trailer parking, Harbor Master Office and deep-water dock. S 178.6 A 231.6 H 0.5 Salty Dawg Saloon & Lighthouse. S 178.7 A 231.7 H 0.4 Seafarer’s Memorial. S 178.8 A 231.8 H 0.3 Homer Spit Campground 907-235-8206. S 179 A 232 H 0.1 Alaska State Ferry Terminal. S 179.1 A 232.1 H 0 Sterling Highway ends at end of Homer Spit, at entrance to Land’s End Resort.